Though people enter into marriage with the best of intentions, things don’t always go as planned and divorce may ultimately be the best path toward greater happiness. Attorney John Bovill III offers a judgment-free environment where you can discuss your goals and available options, as well as devise a collaborative strategy for the ensuing process. We’ll help you take stock of your individual and shared assets and propose an appropriate division of this property in line with your personal goals. 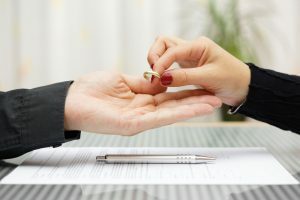 The first questions most of our divorce clients ask are “How long will it take?” and “How much will it cost me?” Unfortunately, the answers to both of those questions depend on a variety of factors, including whether or not you have children, if so how many, what types of assets you own, how long you have been married, and more. That said, divorces in which spouses can agree on important matters such as custody, spousal support, and the division of assets are typically less costly and time-consuming. Since 2010, no states require a divorcing couple to prove fault for the dissolution of their marriage, as long as they both agree to the divorce. In order to get a divorce without the agreement of your spouse, however, you have to prove that they were either abusive, abandoned you, or withheld information that would have prevented you from marrying them in the first place. Even though Michigan is a no-fault divorce state, fault does play a role in custody and alimony decisions. For example, if a spouse abandoned their family but now wants custody of the children, it is unlikely that a judge would side in their favor. When people hear the word “trial,” many automatically envision a jury of their peers. Fortunately, this is not how divorce cases work. If you and your spouse are in agreement about the terms of your divorce, one or more sessions in mediation may be sufficient. If you are not in agreement, you will have to appear before a judge and provide the information he or she will need in order to determine the terms of your divorce. We represent individuals in all kinds of divorces. Attorney John Bovill III represents Saginaw County clients facing divorce and the division of marital assets. If you need help with your divorce, contact our Saginaw office today at (989) 792-4648 to schedule a free consultation with a trusted and effective family lawyer.